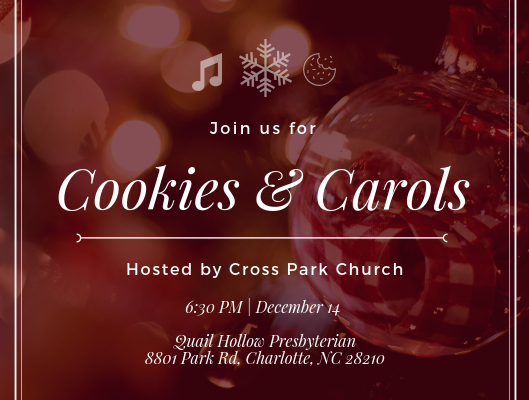 We will host a celebration of Emmanuel—God with us—with Cookies & Carols at Quail Hollow Presbyterian Church (8801 Park Road, Charlotte, NC 28210) at 6:30PM on Friday, December 14. Please join us for sweet treats and even sweeter tunes as we sing together in the sanctuary, then gather for desserts in Johnston Hall (located to the rear of the building on the left hand side of the courtyard). Here is further information in an effort to help navigate their property. If you are able, please bring 1 or 2 dozen cookies to share and/or a crockpot filled with a warm beverage to share (ex. hot cocoa, cider, etc). Don’t forget a ladle! Feel free to share the above image with friends, family, and neighbors so they can join in our celebration of the King.